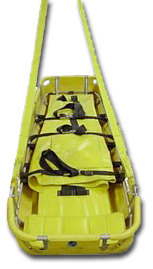 The International Stretcher Systems Yellow Jacket Basket Litter offers a rugged lightweight aluminum frame, protective outer shell,suspended internal bed, four adjustable lifting slings and many other features. The unit has a low center of gravity because the bed is secured to the lower part of the frame. This provides greater security and protection for the patient. The bed itself is attached to the frame by buckles and heavy duty springs providing a fully suspended bed. Shocks are largely absorbed due to the suspension and principle of design, allowing transmission of impact to the patient to be minimized. The Yellow Jacket Basket Litter is load tested to U.S. Military specifications. It supports over 2,500 pounds (or 1,120 kgs.). We also further tested the basket to destruction, which was 9,750 pounds (almost 5 tones!). View the report on the findings of a test undertaken on 27 November 1992, in the Applied Dynamics Laboratory of McMaster University. This stretcher and its accessories are unmatched in their versatility for High Angle, Mine, Industrial, Rough Terrain, Water, Water Craft and Ice Rescue. When secured, the patient may be moved in any position (vertically, horizontally, on the side, or even upside down) in complete safety and without additional trauma, greatly simplifying evacuation over obstacles. The design offers a simple standardized method for immobilizing and transporting virtually all types of casualty over any terrain. This task may be performed in complete darkness, if necessary, in about 2 minutes and requires little training. This system is both patient and rescuer friendly.